Our group meets between 10am and 12am on a Monday morning at Burraton Community Centre. We are a small, relaxed class who meet to enjoy our own individual art or craft preferences. 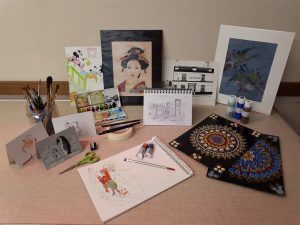 We do not have a teacher as we all help each other to get the best out of our chosen craft which currently includes watercolour and acrylic painting, drawing, pastels, decoupage, pen and ink and dotting. Please email using the Contact Us button below if you feel you may be interested. Alternatively pop along on a Monday morning to see what we are all about.